These mediums are specially formulated to control, enhance, and protect artworks created with Artisan Water Mixable Oils. Offering soap and water cleanup, they're ideal for the painter seeking to avoid the use of hazardous solvents. Note — Artisan Water Mixable Oil Painting Mediums are not to be used with traditional oil colors. As with traditional oils, it is always best to choose one medium and use it throughout the whole painting. Stand Oil — A more durable type of Linseed Oil, Stand Oil is partially polymerized by being heated in the absence of oxygen, thereby producing a longer drying time. 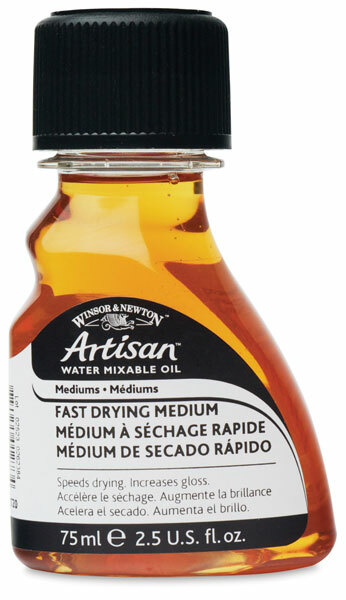 The benefit of Artisan Water Mixable Stand Oil is that it produces a paler, more flexible film that Artisan Linseed Oil with excellent leveling properties. It is therefore a good glazing medium and can be combined with water or Artisan Thinner for this purpose. It also increases gloss and transparency. Thinner — As a substitute for water or combined with it, low odor Artisan Thinner is specially formulated to dilute Artisan Water Mixable Oils. It provides a more oily consistency than water and does not form an emulsion with the paint, thereby producing less color change. It may also be combined with Artisan Fast Drying Medium, Artisan Linseed Oil, and Artisan Stand Oil. Safflower Oil — Lighter in color than Artisan Linseed Oil, Artisan Safflower Oil is sometimes used as a binder in paler Artisan Water Mixable Oils to maintain their brightness. If you are painting with a lighter palette, Artisan Safflower Oil may be a preferable choice for reducing paint consistency and for increasing gloss and transparency. Artisan Safflower Oil is slow drying and should not be used under faster drying layers (e.g. Artisan Fast Drying Medium, umbers, etc.). Linseed Oil — The main binder in the Artisan Water Mixable Oil Color line and the most commonly used of all the Artisan Mediums, Artisan Linseed Oil reduces the consistency and improves the flow of the paints, while also increasing gloss and transparency. It can be combined with water or Artisan Thinner to maintain the structure of the paint film and can also be used when painting in layers to maintain the "fat over lean" rule (each successive layer must have more oil in it than the previous one). 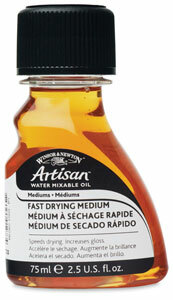 Impasto Medium — This medium thickens Artisan Water Mixable Oils for impasto and texturing and also speeds drying time. Always mix Artisan Impasto Medium thoroughly into colors. For thick impastos, build up the texture in several layers, allowing each layer to dry before applying the next. Painting Medium — This medium thins the consistency of Artisan Water Mixable Oils, improves the flow and wetting of colors, and also aids in fine detail work. It dries slowly to a flexible film and is good for "oiling out" (applying an oil medium to a painting that has sunk, or lost its oil, to the layer underneath). Fast Drying Medium — This popular medium improves flow and speeds drying time by approximately 50%, allowing layers of paint to be applied more quickly. Boasting an improved formulation that now helps wet the colors better, it smoothes brushwork and increases gloss and transparency, making it excellent for glazing and producing fine detail. It is also resistant to yellowing. When painting in layers, it can be substituted for Artisan Linseed Oil and be combined with water and/or Artisan Thinner to maintain the "fat over lean" rule (each successive layer must have more oil in it than the previous one). Note — Artisan Oil Painting Mediums are not to be used with traditional oil colors. As with traditional oils, it is always best to choose one medium and use that throughout the whole painting.